In this topic you will learn how to export lead form data collected through Gallery experiences. Gallery lead form data is collected when a Gallery experience has been configured to use a lead form. For information on configuring a portal experience to collect lead data, see Using a Lead Form with a Portal Experience. 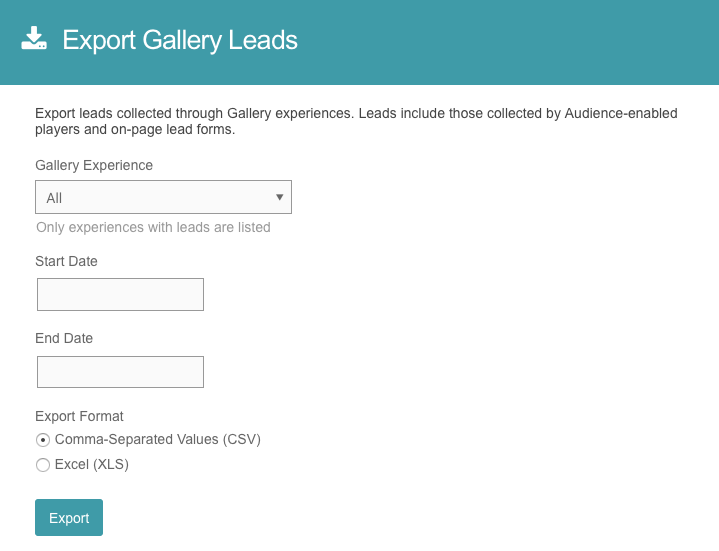 When exporting Gallery leads from the Audience module, only data captured using Audience lead forms will be exported. Lead data from custom lead forms will be stored in your marketing automation software. Note: Only users with Administrator privileges will be able to download the lead data. To export Gallery lead data, follow these steps. Click Export Gallery Leads in the left navigation. Select a Gallery experience to export the leads from. Enter a Start Date and End Date for the leads. Select an export format, Comma-Separated Values or Excel. Click the Export button to download the lead data.